The sacrifices that we make starting in pregnancy, through birth and then that first year are HUGE! while they are trying to get pregnant. with bedrest to help the baby stay in longer. Regardless of when the sacrifices start, one thing is for sure. All moms make sacrifices! We don’t make these sacrifices FOR a medal, but we certainly do DESERVE one. 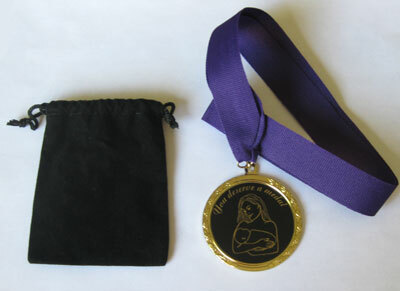 A medal inspired by 2 real life moms. For only $5.95 each. Which Moms Deserve a Medal? Natural Childbirth Moms – birthing without medication is empowering and amazing and, of course, you don’t do it FOR a medal. But you do DESERVE one! Epidural Mom – Maybe you were planning on a natural birth, but your birth lasted so long, you chose an epidural so you could rest. Maybe you got the epidural in the parking lot. Either way, you pushed your baby out! You didn’t do it FOR a medal, but you do DESERVE one! Cesarean Moms – Maybe you gave up your dream for a vaginal birth because your baby was breech. Maybe you had was a scary emergency situation that required a cesarean. Maybe you had a long birthing time and you made the choice for a cesarean. No matter why you had one, you chose to have a major surgery for your baby! You didn’t do it FOR a medal. But you do DESERVE one! VBAC Moms – There were people who said it couldn’t be done. Maybe you had to fight for the right to birth the way you wanted to! Either way you DID IT! You didn’t do it FOR a medal, but you do DESERVE one! PUPPS – You had the Horrible Pregnancy Rash and survived! There are a few select moms who know the itchiness you suffered and I am one of them. YOU totally DESERVE a medal! Adoptive Mom – You didn’t birth the baby, but you worked long and hard and sacrificed to get the baby. You didn’t do it FOR a medal, but you do DESERVE one! Birth Mom – You birthed this baby and chose to give it to a family who has longed for one. You didn’t do it FOR a medal, but you do DESERVE one! Surrogate Mom – You carried and birthed this baby for another woman. You didn’t do it FOR a medal, but do you DESERVE one! Foster Mom – You take care of and love this baby. A baby you won’t have the joy of watching grow up. You don’t do it FOR a medal, but you do DESERVE one! Breastfeeding Mom – You may have struggled the first few weeks of breastfeeding, but you stuck it out! Maybe breastfeeding came easy to you, but you don’t get much of a break. Any breastfeeding mom DESERVES a medal! Working Moms – You work hard to provide for your baby. You miss being with your baby, but know you are doing what is best for your family. You don’t do it FOR a medal, but you do DESERVE one! SAHM – You are home all day without a break. You don’t do it FOR a medal, but you do DESERVE one! Mom of a New Baby – You eat with one hand, you sleep in short spurts, you meet your little one’s every need. You don’t do it FOR a medal, but you do DESERVE one!